First official record: the play was published in quarto in 1598, although the exact date is unknown, as it was not entered into the Stationers' Register at the time. Also in 1598, Robert Tofte mentioned the play in his sonnet sequence Alba. The months minde of a melancholy lover; "Love's Labour Lost, I once did see, a play/Y'cleped so, so called to my pain." The date of publication of Alba is unknown as it also was not entered into the Register. Additionally, the play is mentioned in Meres' Palladis Tamia (registered on 7 September, with a dedication dated 10 October). It is unknown exactly which one of these three constitutes the first official record of the play. 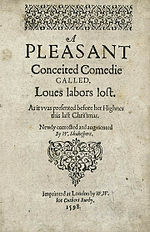 First published: published in quarto in 1598 as A Pleasant Conceited Comedie called Loues labors lost, the first known printing of a Shakespearean play to include his name on the title page (printed by William Wright for Cuthbert Burby). However, due to the note "Newly corrected and augmented," it is known that a previous publication must have existed, which has apparently been lost. First recorded performance: according to the quarto title page, the play was performed at court for Queen Elizabeth sometime over Christmas 1597, however, no further information is provided. The earliest definite performance took place sometime between 8 and 15 January 1605, for Anne of Denmark, at either Henry Wriothesley, 3rd Earl of Southampton or Robert Cecil, 1st Earl of Salisbury's house. Evidence: obviously, the play was written by Christmas 1597, but narrowing the date further has proved difficult, with most efforts focusing upon stylistic evidence. Traditionally, it was seen as one of Shakespeare's earliest plays. For example, Charles Gildon wrote in 1710; "since it is one of the worst of Shakespeare's Plays, nay I think I may say the very worst, I cannot but think that it is his first." For much of the eighteenth century, it tended to be dated to 1590, until Edmond Malone's newly constructed chronology in 1778, which dated it 1594. In his 1930 chronology, E.K. Chambers found the play to be slightly more sophisticated than Malone had allowed for, and dated it 1595. Today most scholars tend to concur with a date of 1594–1595, and the play is often grouped with the 'lyrical plays'; Richard II, Romeo and Juliet and A Midsummer Night's Dream, because of its prolific use of rhyming. These four plays are argued to represent a phase of Shakespeare's career when he was experimenting with rhyming iambic pentameter as an alternative form to standard blank verse; Richard II has more rhymed verse than any other history play (19.1%), Romeo and Juliet more than any other tragedy (16.6%) and Love's Labour's and Midsummer Night more than any other comedy (43.1% and 45.5% respectively). All four tend to be dated to the period 1594–1595. In support of this, Ants Oras' pause test places the play after Richard III, which is usually dated 1592. Furthermore, Gary Taylor finds possible allusions to the Gray's Inn revels of December 1594 (specifically the Muscovite masque in 5.2), and also finds plausible Geoffrey Bullough's argument that the satirical presentation of the King of Navarre (loosely based on Henry of Navarre, who was associated with oath breaking after abjuring Protestantism in 1593) favours a date after December 1594, when Henry survived an assassination attempt by Jean Châtel. All of this suggests a date of late 1594 to early 1595.